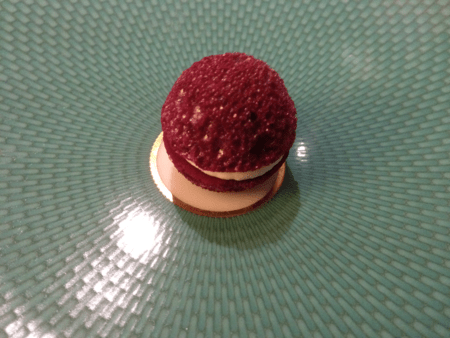 Once inside, our meal began with an amuse of crispy beet foam with horseradish cream, a single bite that dissolved instantly in the mouth. Our server brought out a cart with foam chargers and a dewar of liquid nitrogen. 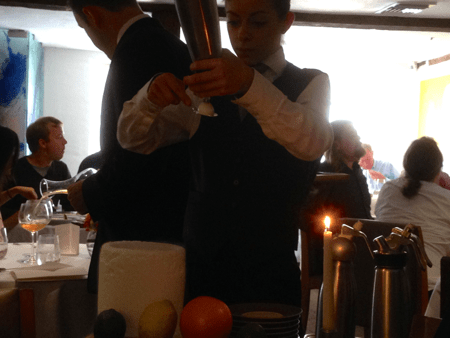 After selecting one of the three apertifs, she piped foam into a spoon and dunked it into the nitrogen. The result was a fragile frozen puff of foam that had to be consumed in a single bite. 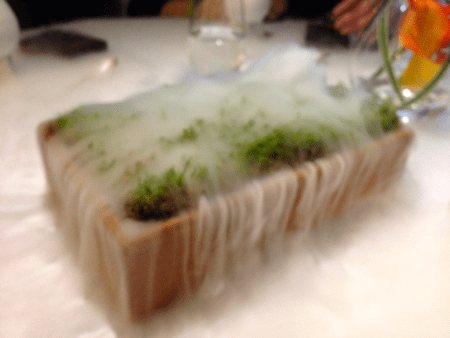 The predictable (and unphotographable) result was puffs of fog escaping from everyone’s mouth and nose. 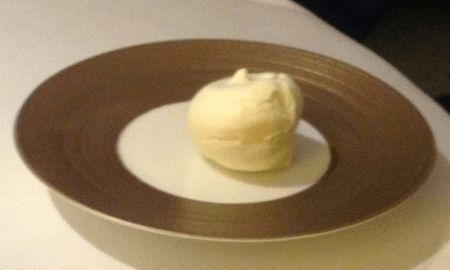 Blumenthal was one of the early pioneers of savory ice creams. 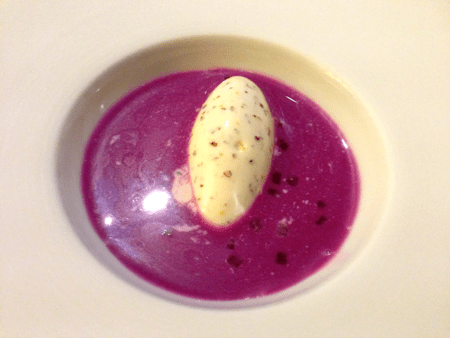 This dish was a sophisticated take on peasant borscht, much less sweet than I expected. This was a study in layering. 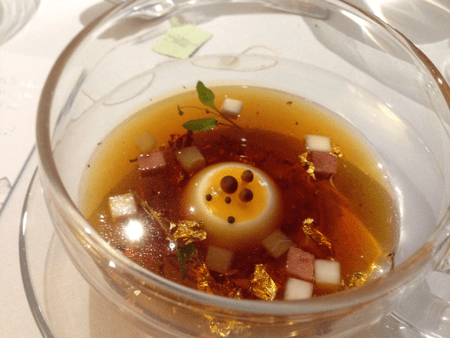 The spherical dish had a rich, jelled quail consommé at the bottom, with a layer of crayfish cream over the top, garnished with chicken liver mousse. 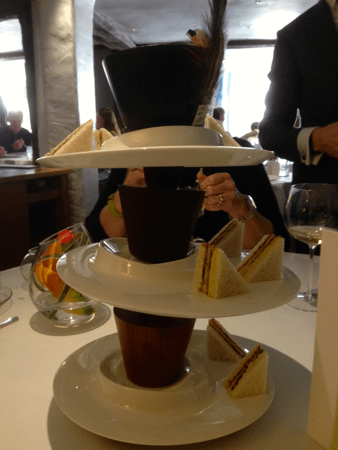 The other plate was truffle-topped toast. 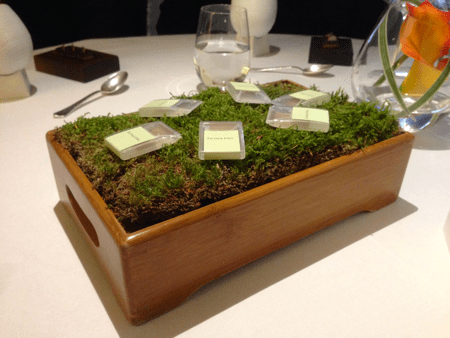 The moss-filed box was topped with moss-scented “breath strips,” which we were instructed to eat before trying the jelly or toast. Once we tucked in, there was another surprise: The server poured a pot of water over the moss, which created a cloud of moss-scented fog. 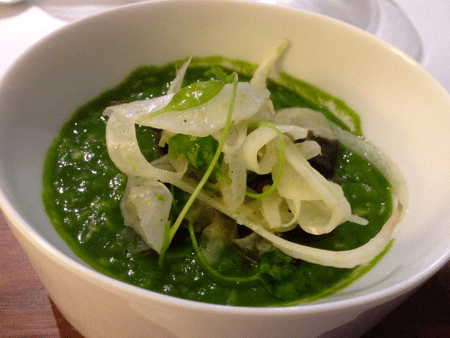 Exactly what it says on the tin: oatmeal porridge prepared with a parsley-infused snail stock, topped with escargot, Iberico ham, and fennel. 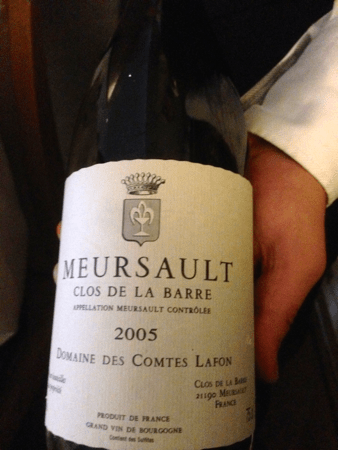 Complex, earthy, and not enough of it. 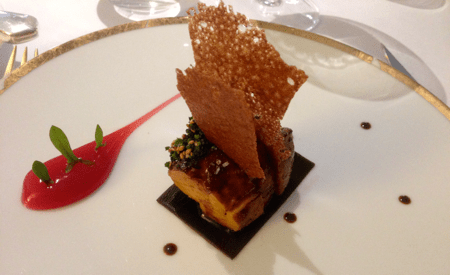 A beautiful preparation of foie gras with the requisite sweet accompaniment (in this instance, gooseberry jam) and two non-traditinal components: oil-poached seaweed and crab crackers for an extra hit of salt and umami. 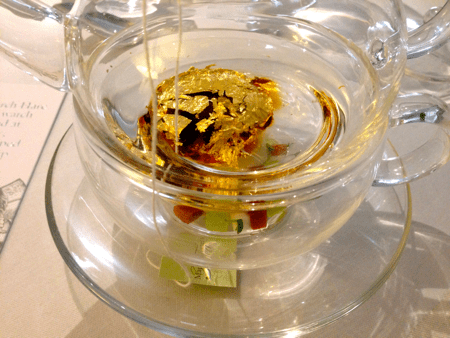 The hot water dissolved the watch, revealing it to be a disk of demi-glace covered in gold leaf. 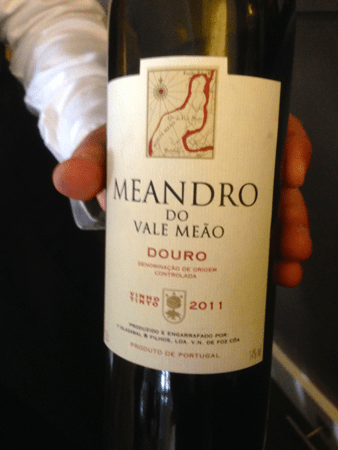 When fully dissolved, we poured the stock into the bottom half, creating mock turtle soup. There was a surprise in the sandwiches as well, a middle slice of toasted bread for an unexpected crunchy texture to the traditional cucumber filling. 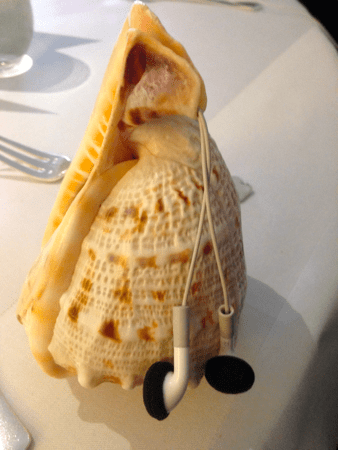 The shell contained an iPod Nano playing ocean sounds. Once we all had the buds in our ears, the rest of the course arrived, presented on top of a tray of sand. 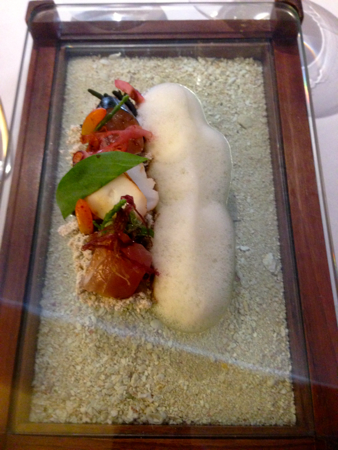 Raw octopus, tuna, sea beans, and salmon roe were garnished with seaweed foam. The illusion of eating on a beach was complete. This one took a bit of sentence parsing to figure out. 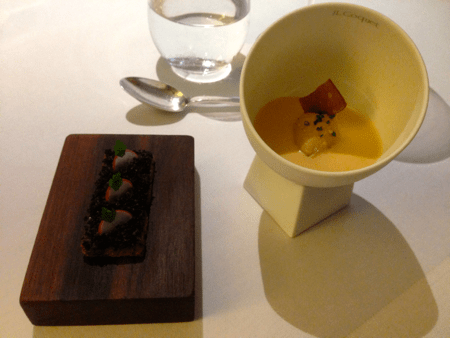 What at first appeared to be salmon poached in something dark – presumably licorice – turned out to be salmon that had been wrapped in a licorice-infused heat-stable gel and poached. 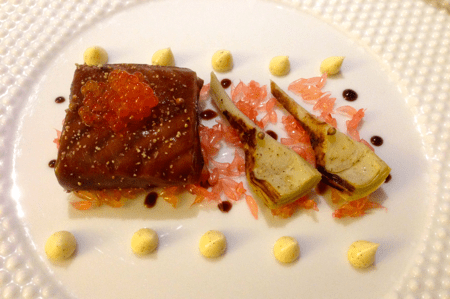 The gel kept the salmon moist while adding just a hint of anise flavor to the dish. The pink garnish was individual pink grapefruit pips. 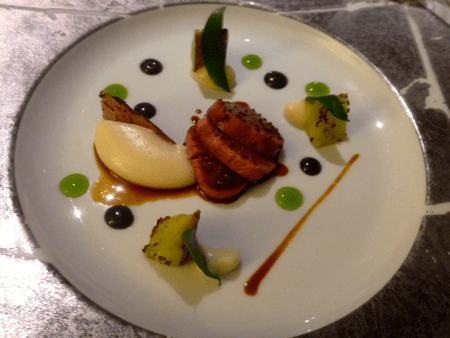 Another historic recipe, lamb loin with grilled cucumber. 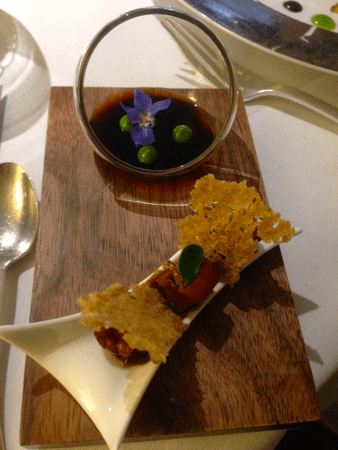 There was a second plate with lamb marrow, crispy skin, and lamb consommé topped with spherified peas. A lovely stunt that marked the transition from savory to sweet, this was a glass of tea that was hot on one side and cold on the other. Because the glass was double-walled, you couldn’t detect the temperature differences by touch. 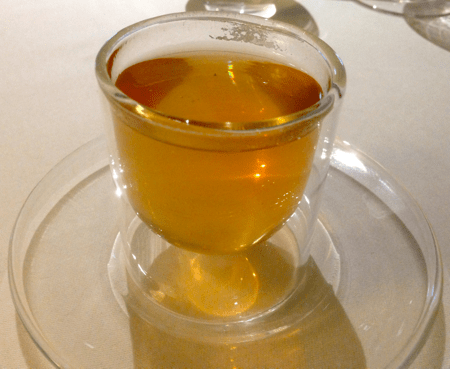 It’s is prepared by pouring hot and cold teas made with different densities of gellan gum into either side of a divider in the glass. When the divider is removed, the teas remain separated for about a minute before they diffuse int each other. 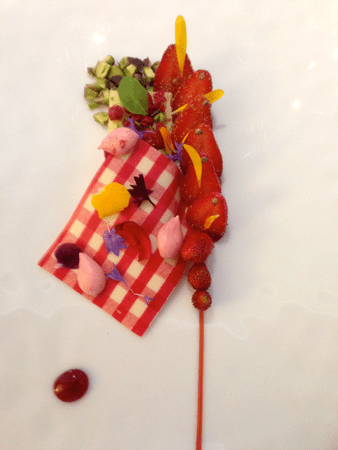 A perfect sumer dessert made with baby strawberries. The “tablecloth” is a printed rectangle of white chocolate. 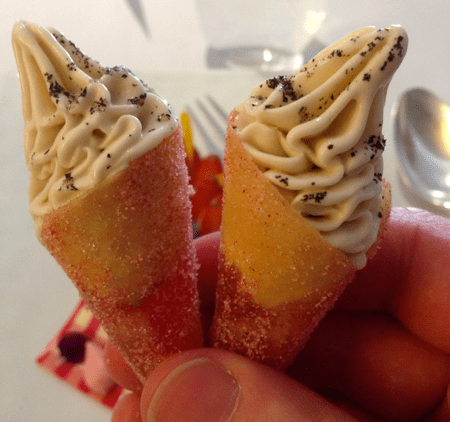 We were also handed two cornets of nitro-frozen ice cream. This may be the best dessert I have ever eaten. 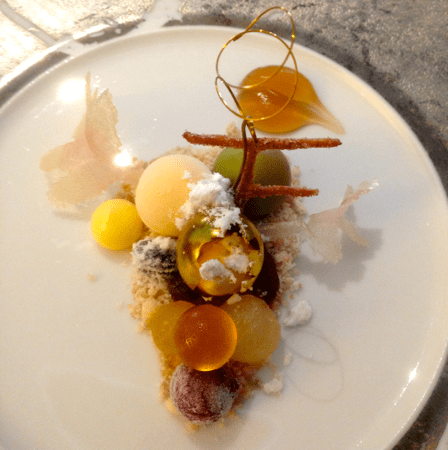 The plate is mean to represent a bunch of grapes infected with botrytis cinerea, or “noble rot” fungus, which is responsible for concentrating sweetness in grapes used to create the great Sauternes and Tokaji dessert wines. Each “grape” was a different preparation: sorbet, mousse, jelly, chocolate, and a gold spun sugar sphere filled with citrus cream. The “stem” was cinnamon pastry, the “leaves” were molded sugar, and the “fungus” was Roquefort powder. It was a complex, but successful balance of sweet and savory flavors. 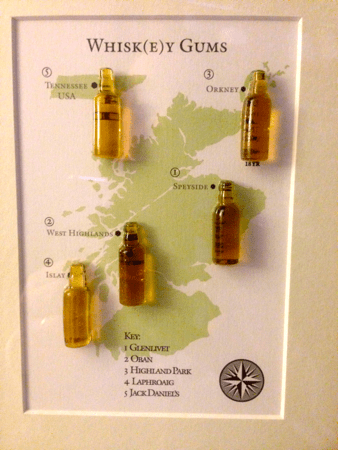 This map of Scotland – and, strangely, Tennessee – held five bottle-shaped gums, each tasting of its regional whisky. They used a rotary evaporator to distill off the alcohol and concentrate the flavor components, since alcohol would have prevented gel formation. A very clever concept. Our final course was a sweet shop bag with three treats and a scented menu. 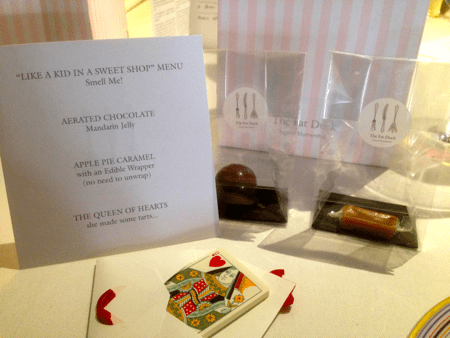 The bonbon was aerated chocolate surrounding mandarin orange jelly, the caramel was apple pie in an edible wrapper, and the playing card was a white chocolate-wrapped strawberry pop tart. The wax seal on the tart envelope was also edible. That was the conclusion of our four-hour lunch. I have to agree. 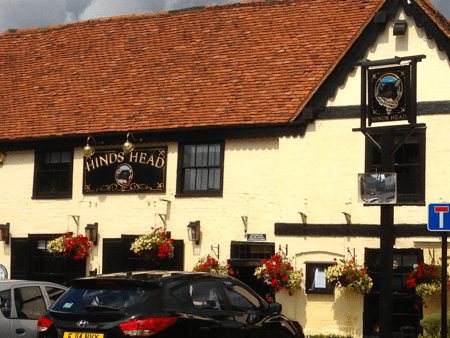 It’s been a month since I ate there, and day doesn’t go by when I don’t think of one of those dishes. And it wouldn’t be my last meal at Blumenthal restaurant, but that’s a story for the next post.